← FOUND – 80’s PUFFALUMP Style PLATYPUS?? DRAGON?? DINOSAUR?? No! It’s a Bird! 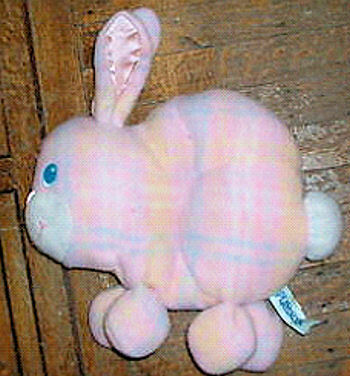 My daughter got this bunny when she was about a year old and lost it when she was 3. She and her “baa” where inseparable. We called it “Night Night Bunny”. When she lost it she was devestated and cried for it every day. Now she’s 20 and going through a difficult time, so I think it would mean the world to her to have her bunny back again. I recently found one on Ebay, but was outbid at the last second – probably to someone who has no sentimental feeling for the item. Please let me know if you ever come across one that you can part with. WEll sorry I do not know were you may find one except for ebay. Right now I am lookng fot a bunny snuzzles stuffed animal too. I would be glad to post your request if you would Contact Us!! Hi! I found one!And it’s not priced outrageously! !